Cache of fine vintage 2mm pencil leads made in Czechoslovakia before 1993 but I think 1930’s to 1950’s. All are NOS = New Old Stock packages of 6 leads. We have limited quantities of 5 different degrees or grades in #3H; #5H; #6H; #8H; and #10H. 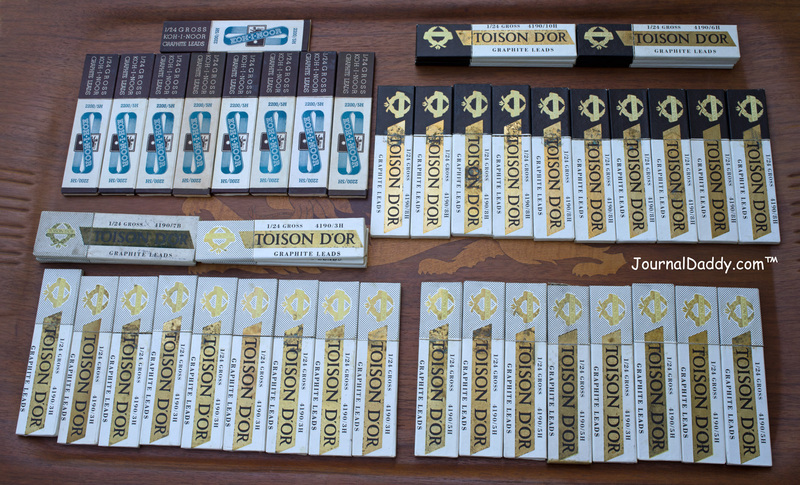 Some boxes are marked Koh-I-Noor and some Toison d’Or* but all are marked Koh-I-Noor Pencil Factory L & C Hardtmuth Czechoslovakia on the backside of the box. These are not common and are a fine writing or drawing lead made by a pencil maker who has been around since about 1790. Each package is the older wood and paper two part box. If you have not seen this type box before it is really a cool package made with a wood tray and paper cover that comes apart with two parts making up the box holding the graphite refill leads. This type box has not been made in a long time. All packages have shop wear and/or age wear but are in very usable condition and the leads inside are in near mint condition and unused. NOS 2.0mm x 120mm refill lead L & C Hardtmuth Koh-I-Noor Toison d’Or* graphite #3H; #5H; #6H; #8H; #10H in paper & wood pack with 6 leads. Your choice of these 5 different degrees or grades leads while quantities last. All dates are approximate and or circa. NOS = New Old Stock; M = mint; NM = near mint; E = excellent; VG very good. The Koh-i-Noor (Persian for Mountain of Light) is a large, colorless diamond that was found near Guntur in Andhra Pradesh, India, possibly in the 13th century. The Koh-I-Noor diamond is in the British Crown Jewels. The Koh-I-Noor pencil appeared in 1888. * Toison d’Or is French for Golden Fleece.